1082 results. Displaying results 41 - 60. Photograph of the back of the old Town Hall, Henley. Photograph by George Bushell & Son of Henley. George Bushell came to Henley in 1919 and took over the task of taking photographs of Henley and its surroundings from two predecessors, called Marsh and Marshall. Bushell died in the 1960s but his business was carried on by his son and grandson. It is his grandson, also called George Bushell, who has donated this important collection of photographs and glass plate negatives to the Museum. 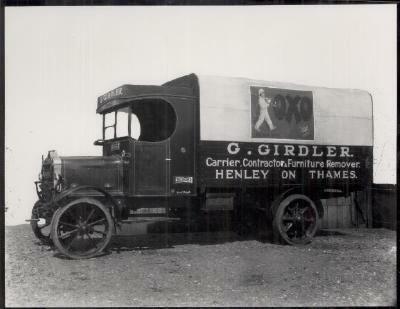 Photograph of a van owned by G. Girdler a "Carrier, Contractor & Furniture Remover" from Henley on Thames. Photograph by George Bushell & Son of Henley. George Bushell came to Henley in 1919 and took over the task of taking photographs of Henley and its surroundings from two predecessors, called Marsh and Marshall. Bushell died in the 1960s but his business was carried on by his son and grandson. It is his grandson, also called George Bushell, who has donated this important collection of photographs and glass plate negatives to the Museum. 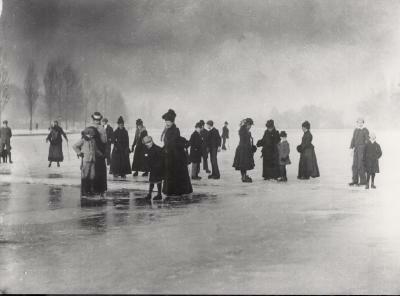 Photograph of people from Henley skating on the River Thames when it froze over, 1909-1910. Photograph by George Bushell & Son of Henley on Thames. George Bushell came to Henley in 1919 and took over the task of taking photographs of Henley and its surroundings from two predecessors, called Marsh and Marshall. Bushell died in the 1960s but his business was carried on by his son and grandson. It is his grandson, also called George Bushell, who has donated this important collection of photographs and glass plate negatives to the Museum. 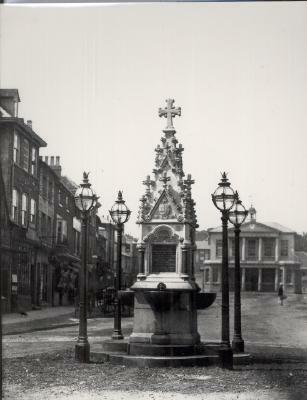 Photograph of the fountain dedicated to G Phillimore that stood in the centre of Market Place before it was moved to the front of St Mary's Church, Henley. Photograph by george Bushell & Son of Henley. George Bushell came to Henley in 1919 and took over the task of taking photographs of Henley and its surroundings from two predecessors, called Marsh and Marshall. Bushell died in the 1960s but his business was carried on by his son and grandson. It is his grandson, also called George Bushell, who has donated this important collection of photographs and glass plate negatives to the Museum. 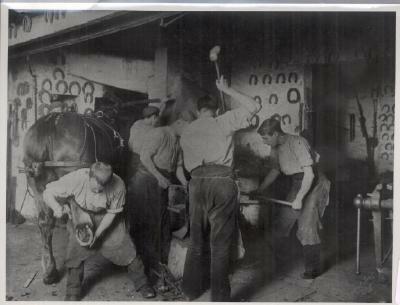 Black and white photograph of a farriers' workshop in Henley on Thames. Photograph by George Bushell & Son of Henley. 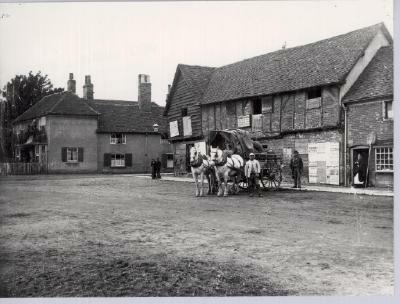 George Bushell came to Henley in 1919 and took over the task of taking photographs of Henley and its surroundings from two predecessors, called Marsh and Marshall. Bushell died in the 1960s but his business was carried on by his son and grandson. It is his grandson, also called George Bushell, who has donated this important collection of photographs and glass plate negatives to the Museum. 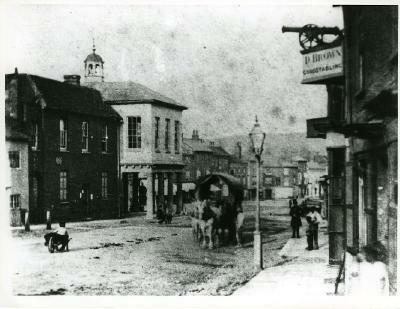 Photograph of the converging of Market Place and Bell Street, Henley on Thames. Photograph by George Bushell & Son of Henley. George Bushell came to Henley in 1919 and took over the task of taking photographs of Henley and its surroundings from two predecessors, called Marsh and Marshall. Bushell died in the 1960s but his business was carried on by his son and grandson. It is his grandson, also called George Bushell, who has donated this important collection of photographs and glass plate negatives to the Museum. 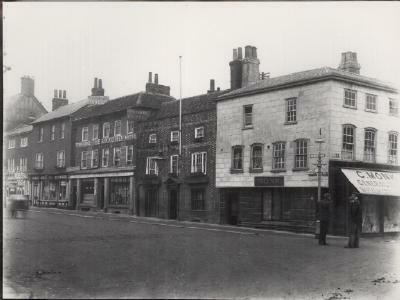 Photograph of a row of buildings in Henley. Photograph by George Bushell & Son of Henley. George Bushell came to Henley in 1919 and took over the task of taking photographs of Henley and its surroundings from two predecessors, called Marsh and Marshall. Bushell died in the 1960s but his business was carried on by his son and grandson. It is his grandson, also called George Bushell, who has donated this important collection of photographs and glass plate negatives to the Museum. 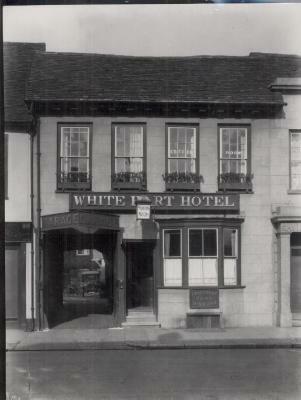 Photograph of the White Hart Hotel in Nettlebed, near Henley on Thames. Photograph by George Bushell & Son of Henley. George Bushell came to Henley in 1919 and took over the task of taking photographs of Henley and its surroundings from two predecessors, called Marsh and Marshall. Bushell died in the 1960s but his business was carried on by his son and grandson. It is his grandson, also called George Bushell, who has donated this important collection of photographs and glass plate negatives to the Museum. 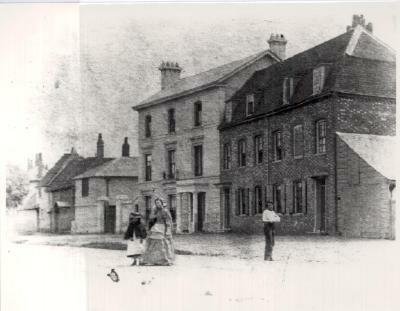 Photograph of a road in Henley during the 1860s. Photograph by George Bushell & Son of Henley. George Bushell came to Henley in 1919 and took over the task of taking photographs of Henley and its surroundings from two predecessors, called Marsh and Marshall. Bushell died in the 1960s but his business was carried on by his son and grandson. It is his grandson, also called George Bushell, who has donated this important collection of photographs and glass plate negatives to the Museum. 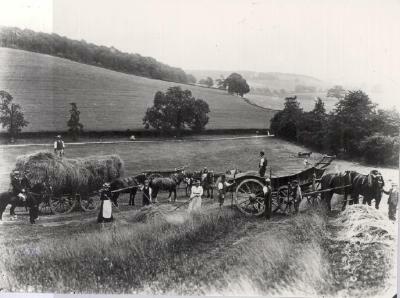 Photograph of haymakers in a field near Henley on Thames. Photogrph by George Bushell & Son of Henley. George Bushell came to Henley in 1919 and took over the task of taking photographs of Henley and its surroundings from two predecessors, called Marsh and Marshall. Bushell died in the 1960s but his business was carried on by his son and grandson. It is his grandson, also called George Bushell, who has donated this important collection of photographs and glass plate negatives to the Museum.